The Real Living Wage enables a person to have a minimum acceptable standard of living with less reliance on benefits, and is calculated annually according to the cost of living in the UK. The Real Living Wage is currently £9 per hour. Living Wage Week 2018 was celebrated between 4 and 10 November. During the first Monday of every Living Wage Week the new real Living Wage rates for London and the UK are announced. Living Wage employers then have until 6 May to implement the new rates. The Real Living Wage rate applied to everyone over age 18, and is £9 for the UK and the London rate is £10.50. By comparison, the national living wage is calculated as a percentage of median income so is not as generous, and does not reflect living costs. For over 25 year-olds the national living wage rate is £7.50. Cambridge City Council pays the Living Wage to all directly employed staff, as well as to agency workers. We also commit to paying the Living Wage to all contracted staff engaged through our procurement processes. In November 2014 the city council received official accreditation from the Living Wage Foundation. We are now working to encourage and support other businesses in Cambridge to become accredited Living Wage employers. There are now more than 60 accredited Living Wage employers in Cambridge. Case study: Abbeyfield care provider supports the Living Wage. Are you based in Cambridge? 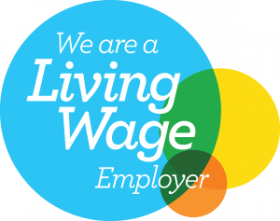 Are you interested in becoming a Living Wage employer? A new National Minimum Wage rate of £7.50 per hour applies for workers aged over 25. The government has called this a "national living wage" but it is quite separate from the Living Wage of £9 per hour accredited by the Living Wage Foundation. £7.50 is the legal minimum for over 25s, but the £9 Living Wage is calculated according to the cost of living - what people need for an acceptable, basic standard of living. It's a rate which employers choose to pay voluntarily to go beyond the statutory minimum. Do you have questions on how your change in income will impact on your benefits? Do you want support in budgeting? Do you have problems with your pay? If you would like help with any of these questions, contact Cambridge and District Citizens Advice Bureau. Phone 03448 487979 between 2 and 4pm, Monday to Friday. More than 60 organisations who are based or operate in Cambridge are now accredited Living wage employers. Cultivate Gardens, Minuteman Press, and Tailored Stays became accredited in January 2019. The punting company Rutherford’s, Cambridge Women’s Aid, and HiTeam web consultants became accredited in 2018. You can see all accredited employers in Cambridge on the Living Wage Foundation’s employer map.